Calendula is a special kind of marigold. It is a flower that has pale green leaves and golden orange petals. Traditionally, it has been used to relieve stress. The Greeks used the flowers to alleviate the symptoms of nervous tension and to prevent insomnia. Marigold is very versatile, and is widely used in commercial calendula ointments and creams. Not all marigolds are medicinal. It is the calendula marigold which has massive health benefits. The constituents include carotenes, flavonoids, glycosides, saponins, triterpenoids and volatile oil. They contain many antioxidant carotenoids. It also contains salycylic acid. Calendula is used as a home remedy, for a host of medical problems related to the head, sunburn, chilblains, body odour, herpes, psoriasis, stress related disorders, scanty periods, chronic ulcers and varocose veins. The bright green leaves are used in poultices and compresses for gout and other swellings. The leaves have also been used to make washes for sore eyes. Calendula oil gives relief from arthritis and bunions. The estrogenic effect in calendula, balances the female reproductive system. 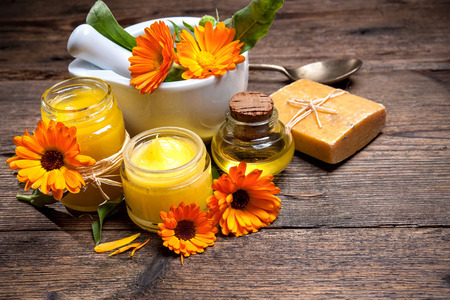 Calendula is very effective as an anti-bacterial, anti-inflammatory, and in wound healing. It is also known to be an effective remedy for colds, fevers, coughs,infections and rashes. It is also used internally for digestive and gynecological problems. Lutein, an antioxidant extracted from calendula may reduce tumors in the breast and prevent new cancers from developing, says a study by researchers from State Washington University. Calendula has also been found to be effective against leukemia, colon and melanoma cancer cells. Calendula has been tradionally used in the area of wound healing. It provides relief when rubbed on burns, and irritated skin. It is said to promote the growth of new skin tissue, as well as new blood vessels that feed the skin. The compounds, triterpenes and steroids in calendula act as anti-inflammatory.